Do your eyes get dry in the winter? Dry eye is one of the most common complaints that patients have during this time of year. The combination of cold air outdoors and dry heat indoors creates an uncomfortable environment for our eyes wherever we are. Eye drops: artificial tears can be very helpful in relieving dry eye symptoms but there are many brands available (some better than others) so it’s always a good idea to check in with your eye doctor before starting drops. As always, pop in, give us a call, or visit highstreeteyecare.ca to learn more about dry eye or any eye-related topics. Look forward to seeing you! February is Age-related Macular Degeneration (AMD) awareness month so we thought we’d give you little overview of the condition and how we can try to prevent it. The macula is the central most part of the retina, the inner layer at the back of the eye responsible for detailed central vision. It is used for reading, driving and recognizing people’s faces. Macular degeneration is a condition that causes the center of your vision to blur while the side or peripheral vision remains unaffected. It is generally related to the aging process, and it is also commonly referred to as age-related macular degeneration (AMD). AMD is the leading cause of blindness in North America in adults over the age of 55. In the earliest stages, macular degeneration is entirely symptom free but can be detected during routine eye health examinations. The most common initial symptom is slightly blurred central vision when performing tasks that require seeing detail. Glasses cannot correct this blurred spot or sense that there is an obstruction in the way of clear vision. Over time, the blurred area may increase in size and interfere with reading and recognizing faces. Other symptoms of AMD can cause straight lines to look wavy or distorted, and dark spots may blank out portions of the central vision. Patients experience no pain with AMD. There are two types of AMD: dry and wet. The most common is the dry form. This is the milder form where there is a gradual degeneration of the central retinal tissues that make up the macula. Symptoms generally develop slowly over time. The wet form is a sudden leakage, or bleeding, from weak blood vessels under the macula. Symptoms of wet AMD progress rapidly. Wet AMD accounts for approximately 10 per cent of all cases, but the dry form can develop into the wet form over time. Any sudden change in vision should be assessed by your doctor of optometry as soon as possible. People who have had extensive UV exposure. Exercise. Lack of physical activity has been linked to AMD. Lifelong UV protection and good nutrition are believed to play a key role in preventing AMD. Living a healthy lifestyle by keeping your blood pressure down, reducing your intake of fatty foods and not smoking are all recommended. A diet high in antioxidants such as beta-carotene (a form of vitamin A), vitamins C and E, zinc, lutein, zeaxanthin, selenium and omega 3 fatty acids may help prevent AMD. Most of these antioxidants are found in green leafy vegetables, yellow and orange fruit, fish, and whole grains. Regular eye examinations by a doctor of optometry are also important in the early detection of AMD. Early signs of AMD may be found during an eye examination even if no symptoms are noticed. Your doctor of optometry can discuss ways to minimize the possibility of vision loss due to AMD. Currently, dry AMD is treated with ocular vitamin supplementation and lifestyle modifications such as exercise, sunglasses to reduce UV radiation and smoking cessation. Many cases of wet AMD can be treated with medications injected into the eye to stop leaking blood vessels. Early detection and prompt intervention are crucial to addressing wet AMD. Certain vitamins can also assist in slowing down the progression of AMD. The use of vitamins will not reverse any vision loss that has already occurred, nor will it stop the progression of AMD completely. Regular eye examinations and counselling from your doctor of optometry will let you know when new treatments become available. Come in to chat further about macular degeneration. You can book an appointment with us online, over the phone, or in person. Imagine for a moment that there exists a disease that could potentially take 15 years off your lifespan. Let’s say, for the sake of this discussion, that this same disease could also significantly increase your risk of heart attack, stroke, kidney disease, and blindness. And now, let’s say that almost one third of the entire Canadian population either has this disease or is on the verge of acquiring it. Would this disease be something worth speaking about? Where would you rank this disease on your list of health concerns? What would a disease with such significant and wide-reaching effects be called? Well, it turns out we already have a name for it; we call it diabetes. Yes, diabetes. The same diabetes that seems to have nonchalantly found its way into the lives of so many Canadian families. The same one that, all too often, is spoken about like it’s a minor nuisance rather than a potentially serious illness. As if having high blood sugar is some sort of innocuous topic of discussion instead of a truly ominous indicator of poor health. This same disease is the leading cause of acquired blindness in Canadians under the age of 50. It contributes to 30% of strokes, 40% of heart attacks, and 70% of non-traumatic limb amputations. In fact, the effects of diabetes on the public health care system have been so dramatic, it has officials at Diabetes Canada pleading with the federal government to develop a national strategy for intervention, calling it an epidemic. There are currently over 3.5 million Canadians living with Type 1 and Type 2 diabetes. It is projected that number will reach over 4.6 million by 2028. That is a 32% increase in one decade. However, what is more concerning about diabetes is the insidious nature of its onset. It is well documented that, by the time a patient with type 2 diabetes is officially diagnosed, they have likely already had the disease for about 5 years. According to Diabetes Canada, it is estimated that there are currently over 7 million Canadians who are either undiagnosed or pre-diabetics. That means that, all together, there are over 10 million people (28% of the population) who are potentially at risk of suffering from the negative effects of diabetes. Diabetes is a chronic disease that occurs when the body either does not produce enough insulin or cannot effectively use the insulin it produces. Insulin is a hormone that regulates blood sugar. The increase in blood sugar that occurs due to the lack of insulin (or the ineffective use of it) is called hyperglycemia. Over time, hyperglycemia can lead to serious damage to many of the body’s tissues. Diabetes is a leading cause of vision loss in Canada. The risk of blindness is 25 times higher for patients with diabetes compared to those without diabetes. The primary condition that is related to this vision loss is called diabetic retinopathy. Over time, increased levels of glucose in the bloodstream cause damage to the small blood vessels in the back of the eye (retina). Eventually, this can lead to weakening of the blood vessel walls, which leads to leakage of blood and fluid into the retina. Diabetic retinopathy can have consequences of varying degrees. Patient symptoms can range from mild blurriness to severe vision loss due to conditions like retinal detachments and large hemorrhages. Diabetes can also increase a person’s risk of developing other ocular conditions such as glaucoma and cataracts. The most reliable way to confirm the presence and the degree of diabetic retinopathy is to have comprehensive eye exam. During this examination, doctors will often use drops to dilate the patient’s pupils allowing them to take a more detailed look at the retina. Studies have shown that signs of diabetic retinopathy in type 2 diabetics can often be detected even before blood sugar levels reach diagnostic levels. This means that regular eye exams can be vital in early diagnosis of the disease. As an optometrists, over the years, we have seen patients on both ends of the diabetic retinopathy spectrum. On one end, we have seen the devastating long-term vision loss that can result from uncontrolled hyperglycemia, along with the decreased quality of life and the loss of hope that come with losing one’s eyesight. However, on the other hand, we have seen the incredible rejuvenation of patients who were once on the verge on significant ocular disease. We have had the pleasure of witnessing patients turn their lives around by making the necessary changes in their lifestyle that have led to weight loss, improved vision, and overall better lives. Finding a solution to the greater problem of the diabetes epidemic seems like a daunting task. With one third of an entire nation at risk of acquiring this potentially devastating disease, it’s hard to fathom where to even start. Without doubt, it will require a complicated and multi-factorial approach by the government, the health care system, and the public. However, if we narrow our focus, we will find that the starting point is actually quite clear. Start with you. Make the changes that you know are necessary to live a full, healthy life. Eat well, get some exercise, and talk to your doctor. It can be done. We’ve seen it with my own eyes. As the summer winds down and our focus shifts from fun in the sun to getting back to the grind, now is the perfect time to also shift our thinking about how we protect our eyes. In the warmer months, we are all aware that UV rays from sunlight can be harmful to our eyes, so we put on our favourite pair of stylish shades and head out into the world knowing that we’re doing the right thing for our eye health (while also looking great, of course). But as the seasons change and we head back to school and work, we will be spending far less time outdoors yet more time being exposed to a different sort of light that can also be detrimental to our eye health. The screens on all of the digital devices we commonly use throughout our day (phones, tablets, computers, flat screen TVs, et cetera) emit a type of high-energy light often referred to as blue light. High-energy blue light is actually all around us, and the largest source of it is sunlight. In fact, because these short-wavelength rays scatter more easily when they travel through air and water, blue light is what makes the sky look blue. Blue light is also essential to our health. Studies have shown that exposure to blue light is important in regulating our circadian rhythm (our wake and sleep cycle). In this way, it boosts alertness, helps cognitive ability and elevates mood. However, in recent years, our increased use of computers and digital devices has brought us much closer to artificial sources of blue light. Now, the number of hours we spend exposed to blue light on a daily basis makes it a true concern for our health and wellbeing. From a visual comfort perspective, blue light is quite disruptive. Because high-energy light scatters more easily than other visible light, it is not as easily focused by our eyes. This can lead to digital eye strain, which can result in fatigue, blurred vision and headaches. The effects of blue light on our overall health can be wide-ranging. The primary concern, as researchers at Harvard University and many other institutions have shown, is that increased exposure to blue light in the evening can disrupt our circadian rhythm, which can lead to poor sleep patterns. Also, it’s been well documented that a lack of sleep can ultimately increase the risk for significant health concerns such as depression, diabetes and cardiovascular problems. With our work and personal lives progressively becoming more immersed in the digital world, it’s hard to recommend a complete ban on digital devices. However, the simplest thing we can do to improve our visual outcome is to decrease unnecessary screen time. This step is particularly important for the younger generation. 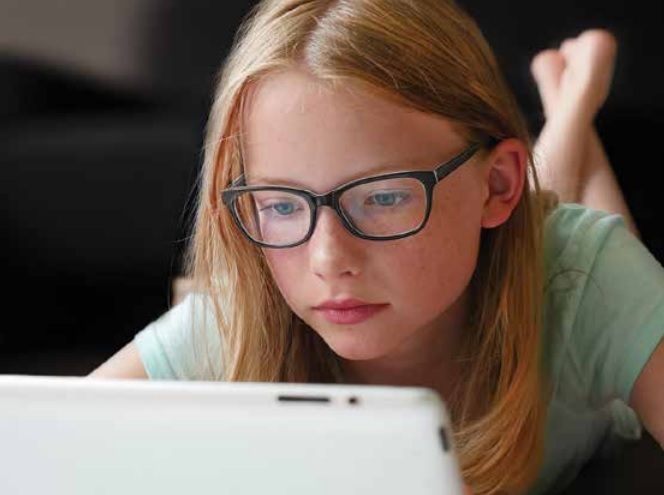 The Canadian Association of Optometrists and the Canadian Ophthalmological Society recently released a joint statement recommending no more than two hours of recreational screen time for children aged five to 18. The same statement also strongly recommends limiting screen time at least one hour before bedtime to allow our sleep cycle to activate fully. For those of us who must spend time in front of screens, there are ways that we can more actively protect our eyes against the harmful effects of blue light. Advances in optical lenses have provided a great new option to help us filter out the high-energy light that would otherwise penetrate the front of our eyes and potentially result in digital eye strain. These lenses, which we generally refer to as blue-blocking or blue-filtering lenses, are a great option for anyone, young or old, who spends time in front of screens. As we continue to integrate digital devices into various facets of our lives, it’s vital to remember the potential effects that these new technologies can have on our health. Protecting our eyes today can allow us to preserve our vision in the future. See this article featured on BCBusiness.ca here. We all know that running can help keep our heart healthy. But did you know that it can also help protect your eyes? Recent research, which will be published in the journal of Medicine & Science in Sports & Science, reports that the more fit and active a person is, the less likely they are to develop glaucoma! The study analyzed data from more than 9,500 people between the ages of 40 and 81. The researchers compared each individual's aerobic fitness and their average amount of weekly exercise to how many subjects developed glaucoma during the 6 year follow up period. The researchers found that those who were most active and fittest had ONLY HALF the risk of developing glaucoma as the least active group. So, just in case you needed another reason to get active... Now you know that getting regular exercise doesn't just keep your heart health, it can also protect your eyes! As always, if you have any questions or concerns about your vision or health, please get in touch! Perhaps the most commonly asked question by parents of young children is, "how much screen time should they be allowed"? Until recently, there were no specific guidelines on how much time children should be spending on screens. Fortunately, based on research and date collected over the last few years, the Canadian Association of Optometrists and the Canadian Opthalmological Society have released their suggestions for safe screen use among children. These days, screens of all types (TV, computer, tablet, phone) are everywhere. They are, for the most part, unavoidable. As such, it's not surprising that we have seen a significant increase in nearsightedness in the younger population. A 2016 study by the University of Waterloo stated that the combination of more screen time and less time outdoors was resulting in 29 percent of children between age 11 and 13 to be nearsighted. Another report, from a survey done in 2014 on 200 American children, found that 80 percent of participants reported burning, itchy, or tired eyes after using digital devices. Regular eye exams, which assess a child’s visual ability to cope with their visual demands and offer treatments for deficiencies. Check out this great infographic from the Canadian Association of Optometrists for nice review of the report. As always, we are very happy to see children for their routine eye exams as well as any time other concerns may arise with the vision or eye health. May is Vision Health Month so we thought we'd take a minute to chat about eye health and the amazing things that can be seen during the eye health portion of your eye exam. We've all heard the saying that "the eyes are the windows to the soul". But, the truth is that they are actually the windows to our health! During a routine, comprehensive eye exam, it is not unusual for your Doctor of Optometry to notice signs related to systemic conditions such as high blood pressure, diabetes, and cholesterol. Aside from testing your vision and determining your glasses/contact lens prescriptions, we are always sure to take a very close look at the internal health of your eyes as well. Did you know, the optic nerve in the back of the eye is actually an extension of the brain? This means that in some cases, we are able to detect serious issues such as brain tumours, multiple sclerosis, and others by evaluating this part of the eye closely. Did you know, the retinal blood vessels in the back of the eye are directly related to the blood vessels in the brain and are only a few branches away from the heart? The eye is the only place in the body that we can see our blood vessels in their natural environment. This is how, by looking into the eye, we can detect conditions that are associated with the heart such as blood pressure and cholesterol. So, don't forget to get your eyes checked regularly so we can make sure you have clear vision and health eyes! At Highstreet Eyecare, we are proud to be part of the BC Doctors of Optometry initiative called Eye See... Eye Learn (ESEL). ESEL is a program geared specifically toward children in Kindergarten. The goal is to ensure that as many kids as possible receive a full eye exam to help them see their best to as the embark on their educational journey. To learn more, click here for the ESEL brochure or feel free to contact us anytime.